In this 13 lesson collection from renowned artist, Susan Scheewe, explore a variety of subjects for rendering in either acrylic or watercolor. Susan experiments with new compositions in a fresh and contemporary approach as she kindly demonstrates in step-by-step instructions to entice you to pick up your brush! From the soft inviting hues in "Window Flower Box" and "Summer Garden" to refreshing coastal shades of "Sentinel" and “Sea Treasures”, each original scene is beautifully composed by Susan herself! Beginners and seasoned artists alike can benefit from Susan’s expertise as she provides tips and techniques to help guide you thru projects of your very own. Your finished pieces whether on canvas, wood, or metal make beautiful home accents in any room or treasured gifts from the heart to share with friends and family. 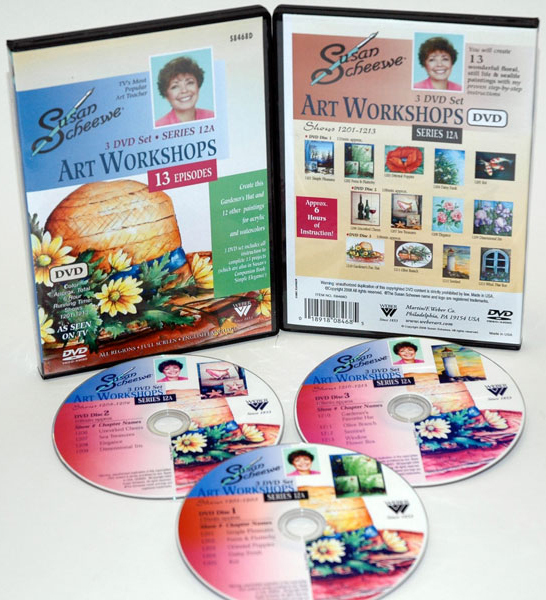 Originally featured on the PBS series, Susan Scheewe Art Workshop, each lesson is approximately 30 minutes, full screen and in English language.